In the 18th century, a group of French political economists, called the "Physiocrats," used the Chinese imperial system as a basis for their calls for "enlightened despotism" in France. Headed by Francis Quesnay (1694-1774), a doctor in the French royal court, the Physiocrats saw much to admire in the Chinese notion of imperial rule. Quesnay, whose life spanned the rule of both the Kangxi and Qianlong emperors in China, argued for "enlightened despotism" on the part of the ruler and laid out a set of economic and social laws that formed a "Natural Order" that should guide the ruler. The Chinese system of rule relied on a strong central government headed by an emperor, who, with his many relatives, constituted a ruling family and lineage. But the emperor did not necessarily have the absolute power that is often associated with traditional monarchy. The Chinese never had an understanding of the power of the king in terms that were used in Europe. That is, the Chinese never believed in the "divine right of kings." Rather, they believed that an emperor had to be an exceptional being — a sage king — who could mediate the cosmic forces. The emperor was also not invulnerable. His actions had to be tempered by basic political expectations, and he had to do the things that an emperor should do. If he did not do these things, he could be overthrown, and this would be considered legitimate. If such a thing occurred, the emperor would be understood to have lost the "Mandate of Heaven." When a new dynasty was established, it was believed that the Mandate of Heaven had passed to the ruling house. It is interesting to note that when the Manchus overthrew the reigning Ming dynasty and established the Qing dynasty, they announced that the Ming had lost the Mandate of Heaven. And yet, in fulfilling their ceremonial responsibilities as the new holders of the Mandate, the Qing emperors continued to venerate the Ming emperors. The ritual veneration of emperors from the fallen dynasty was important because the Ming had legitimately held the Mandate of Heaven at one time. By ceremonially honoring the Ming as past holders of the Mandate and their legitimate predecessors, the Qing were actually justifying their own claim to the Mandate of Heaven, by asserting their own position as the Ming's legitimate successors. "The Seventh Scroll respectfully depicts his majesty's travels from Wuxi through Hushuguan to the Chang Gate of Suzhou where, seeing the throngs of people crowding the streets and narrow waterways, he specially reduced the size of the honor guard [accompanying him] into the city. Officials, gentry, and commoners, even white-haired old men and small children, all were moved by the emperor's great favor; happily beating drums, burning incense, and hanging up bunting they prostrated themselves on both sides of the street to welcome him. The emperor's stopover gave them a chance to behold [the personification of] a flourishing age; the sincerity of their love for him was clearly visible. Again and again, the people detained the emperor, offering him wine and fruit and singing hymns of praise. In painting this picture it has been difficult to convey all of these details. This is because our emperor has compassion for the people of Wu, remitting taxes, canceling rents, and so much more, thereby creating boundless goodwill in people's hearts. As for the fact that on a small prominence on Tiger Hill, the people erected a pavilion to commemorate his largess and wish him longevity, it was also recorded [in this painting] with brush and silk." The Chinese government during the Qing was an integrated bureaucracy — that is, political power flowed from the top to the bottom through a series of hierarchically ordered positions that extended down to the county level, where a local magistrate headed a county office, called the yamen. This hierarchically integrated bureaucracy was remarkable because the people who had positions as officials within the bureaucracy were not there because they were members of a hereditary aristocracy. Rather, they had acquired their positions according to a system of merit. This system of meritocracy — perhaps the first of its kind in the world — was established on the basis of government examinations. Those who had the ambition to become government officials were schooled from an early age in the canonical literature and the philosophical works of China's great Confucian tradition. It was through this learning that would-be officials would not only be able to formulate a personal, moral and ethical structure for themselves, their family, and their local community, but also develop an understanding of how one should appropriately act as a member of the group of people that rules the state. Examinations were given at the county level, and successful candidates progressed to higher levels, all the way to the highest-level examinations, which were given at the imperial capital. If one could pass the examinations at this level, then chances were very great that one would certainly become a member of the small coterie of elite bureaucrats that ruled China. Of course, the ability of someone to get the education needed to sit for these examinations relied to a certain extent on wealth, although families often coordinated their wealth so that the brightest and most promising of their children would be able to rise through this system. 4. A Government of "Elite Commoners"
An important consequence of this system of meritocracy that peopled the Chinese bureaucracy with the best and the brightest of the literati was that the state was not ruled by aristocrats that had inherited their positions. Rather, it was a state ruled by those who were of the "common people," although often they were the elite among the common. Nevertheless, they had ties to families, relatives, and others who were engaged in non-government occupations (such as merchants, farmers, and landowners). During the time that the Qing dynasty ruled China, these ideas (of a civil government based on meritocracy and social responsibility) were admired and promoted by prominent writers and philosophers of the 18th-century Enlightenment period in Europe and the 19th-century Transcendentalist movement in America, including Voltaire in France, English diplomats serving in China, and Ralph Waldo Emerson in the United States. It is interesting to try to understand how Europeans were learning of China during this time, and what their reactions were to Chinese ideas and learning, and how understandings — and misunderstandings — of Chinese culture had a profound impact on the society and cultural beliefs of Europe during this time. The Chinese understanding of political legitimacy is linked to the imperial system of rule, based on the notion that the state is responsible for the welfare of the people and for the peace of the people with their neighbors. The biggest responsibilities of the state are to make sure that the people are able to live, have enough food, work comfortably in their professions, and raise their children. Because of this, the Chinese imperial state is often described as a "paternalistic state." Foremost among the expectations that the Chinese citizenry have of their state, even today, is that the state will always put the welfare of the people first. The other major expectations of the populace are that the state will keep peace and keep China safe from foreign threats. But there are tensions within the reform process that make it very difficult for the state to guarantee, particularly internally, that the welfare of all will be adequately secured. This may explain why in recent years the Chinese government has been so focused on its ability to keep the Chinese territorial state intact and safe from foreign threats, as well as, of course, enhancing the prestige of China within the international community. The particular organization of the Chinese bureaucracy meant that officials continued to move between the local communities out of which they came, on the one hand, and the more centrally oriented community of bureaucrats, on the other. So an official would have two senses of identity: one local and the other oriented toward the state and the emperor, for whom he was expected to demonstrate absolute loyalty. During Qing times the Chinese state system, though it was a monarchy, was not a monolith. The bureaucracy always had to worry about and accommodate local circumstances. On the one hand, the state wanted to implement policies that were fair and uniform throughout the empire, but this was not always possible because China was incredibly diverse, as it remains today. There were coastal provinces and inland provinces, provinces where many people engaged in non-agricultural activities, and provinces where people did nothing but practice agriculture. Thus, it was very difficult — even impossible — to apply a policy uniformly throughout the empire. This tension between state and local interests was often reflected upon by officials in their "memorials" or communications to the emperor, (see Secret Palace Memorial System, below). These officials felt that while they served as officials, they were serving the state, but that when they went home (to their home provinces), they found themselves more concerned about the local community and wanting to make sure that there would be state policies favoring the interests of their own local community. Recognizing that officials existed in these two "skins" — one of official identity and one of local identity — the bureaucratic system was organized to prevent, whenever possible, people from acting in their official capacity in such a way that it would unfairly benefit their home province. This was done through the "rule of avoidance," which stated that an official could not serve in his home province or even in a province adjacent to his own province. Officials also served in each position for a relatively short period of time (usually three years) before rotating to a new position. One might argue that when people are rotated out of their positions too soon they are unable to really understand what is going on in the area in which they are serving, but the benefit is that they never become too attached to one place or too supportive of interests that applied only to that place and not to the empire as a whole. Ralph Waldo Emerson (1830-82), an American writer and philosopher who lived during the time of Qing rule in China, espoused in his writings the Confucian notion of the moral cultivation of each person as the foundation for social responsibility and good government. In France, Voltaire (1694-1778) championed the idea of the civil service examinations, while in England, writers and diplomats, such as British diplomat Thomas Taylor Meadows (1815-1868), called for "the institution of Public Service Competitive Examinations for all British subjects with a view to the Improvement of the British Executive and the Union of the British Empire." Meadows, in particular, maintained that "the long duration of the Chinese empire is solely and altogether owing to the good government which consists in the advancement of men of talent and merit only." Though the notion of "nation" as now defined and understood in the West was not part of the political lexicon under the Qing dynasty, there was nonetheless in the policies implemented by the official bureaucracy a sense of loyalty to one imperial, "national" entity, and a sense that policies should be applied equally throughout the empire. The resulting tension between local and empire-wide "national" interests played itself out in the daily activities of officials. The effectiveness of the Chinese style of rule during the Qing period is most evident when one thinks about the number of people that the Qing state governed. The population of China in the 1600s, when the Manchu Qing conquered China, was somewhere in the vicinity of 100 million people. At the beginning of the 1800s, China had about 300 million people (a number that was not greatly influenced by the new areas that the Qing had added to the empire in the 18th century, which were relatively sparsely populated border regions). By the time the Qing dynasty fell in 1911, China had close to 400 million people. Thus, there was a fourfold increase in population during the period of Qing rule, yet the institutions that were put into place in the 1640s when Qing rule began (institutions largely inherited from earlier dynasties) managed to sustain a well-functioning state all the way to the fall of the empire in 1911. The rapid growth in population did contribute, however, to what came to be one of the greatest weaknesses within the Qing bureaucratic system — the local magistrate. The magistrate was at the lowest level of the bureaucracy and had a very large area to control, but he was not always able to do so effectively with the resources that were given to him by the state. By the end of the Qing period, when the Chinese population had increased fourfold, a single magistrate and his office could be responsible for as many as 300,000 people. The Qing rulers implemented many innovations in the ways in which government was run, one of which relates to the difficult task of providing necessary services efficiently to a large and diverse population. The Yongzheng emperor, who ruled for just 13 years (after his father, the Kangxi Emperor, and before his son, the Qianlong Emperor), undertook a monumental reform of the state tax system, transforming Qing taxation policy to provide a reliable revenue stream at the local and national levels. 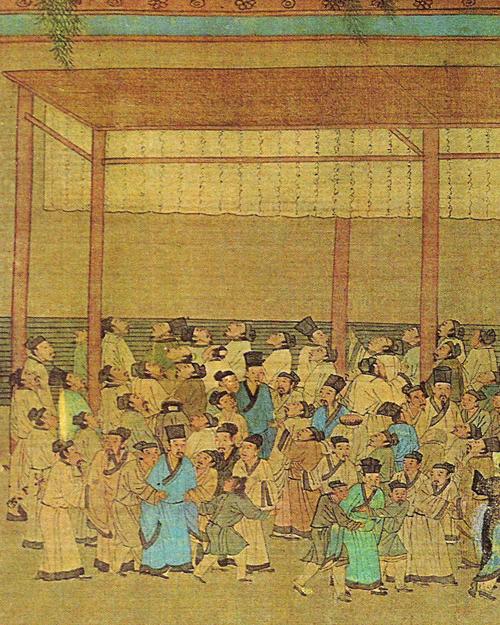 The taxation system that the Qing inherited from the Ming was one that was focused entirely on providing sufficient revenues for the central state and left the management of local government expenses up to local officials to meet as they could. This older system left enormous openings for corruption. The Yongzheng emperor transformed this system into one which provided for a revenue stream specifically for local government. This was a remarkable reformation, for it allowed local officials for the first time to have a sense of how much money they were going to have available to them, so that they did not have to rely completely on what has been called "squeeze" in order to fund the projects that they needed to fund, such as road repair, wall building, and granary construction. It also meant that there would be fairly clear demarcations between what was the fiscal base of local governments and the fiscal base of the central state. Perhaps not surprisingly, in Qing dynasty times no one ever thought to institute a personal income tax. Indeed, such a tax would have been virtually impossible to implement. Rather, China based its tax revenues almost entirely on land; that is to say, the government taxed farmers. To a lesser degree, government revenues also came from certain government monopolies — most importantly the monopoly on the sale of salt, which was an everyday commodity that everyone needed. What the Qing state did not do, on the other hand, is tax the commercial sector in any significant way. This may come as a surprise to those who think of China as a state that has tightly controlled the economy throughout the years. The impact of this non-commercial tax policy was that as China’s population continued to grow under the Qing, even the great tax reforms of the early 18th century became insufficient to meet the needs of the growing state system. This is one of the reasons that China looks so dysfunctional in the late 19th century — quite the opposite of the situation in the 18th century. But in fact, China has had problems related to finances throughout its long history. Many of the fiscal problems that the Qing emperors encountered are similar to problems that can be seen in China today. 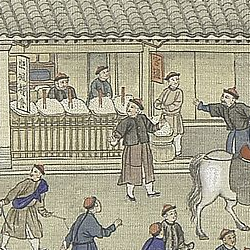 Guan Yan" — Store in Suzhou selling "government salt," from the The Qianlong Emperor's Southern Inspection Tour, Scroll Six: Entering Suzhou Along the Grand Canal The Qing government maintained a monopoly on the sale of salt, an everyday commodity, but did not otherwise burden the commercial sector with heavy taxes. Another important innovation that took place during the Qing period was to improve the communication system that existed between government officials and the state in earlier periods of Chinese history — the system of "memorials" or communications on policy written by local officials and sent to the central government. Building on this existing system, the Qing introduced the "Secret Palace Memorial System," which was an opportunity for the emperor to communicate directly with officials. These Secret Palace Memorials went directly from local officials — largely provincial governors and those working under them — to the emperor himself, with no mediation by the court or transmission officials in the palace. In fact, these "memorials" were transported under lock and key, with locks that came from Europe. During the period referred to as the "High Qing" (when the Kangxi and the Qianlong emperors ruled), this Secret Palace Memorial system operated very well. The High Qing saw very energetic emperors who, for the most part, read these memorials themselves, or had small committees of people reading the memorials and functioning like an imperial cabinet. In this way the Qing emperors were able to get more accurate reports of how policies were functioning within the local context than had emperors of dynasties past. This supported the ability of the Qing state to adjust its local policies accordingly to ensure the popular welfare, and also enhanced the ability of the state in the 18th century, particularly under the Qianlong emperor, to expand its reach into newly subdued territories.